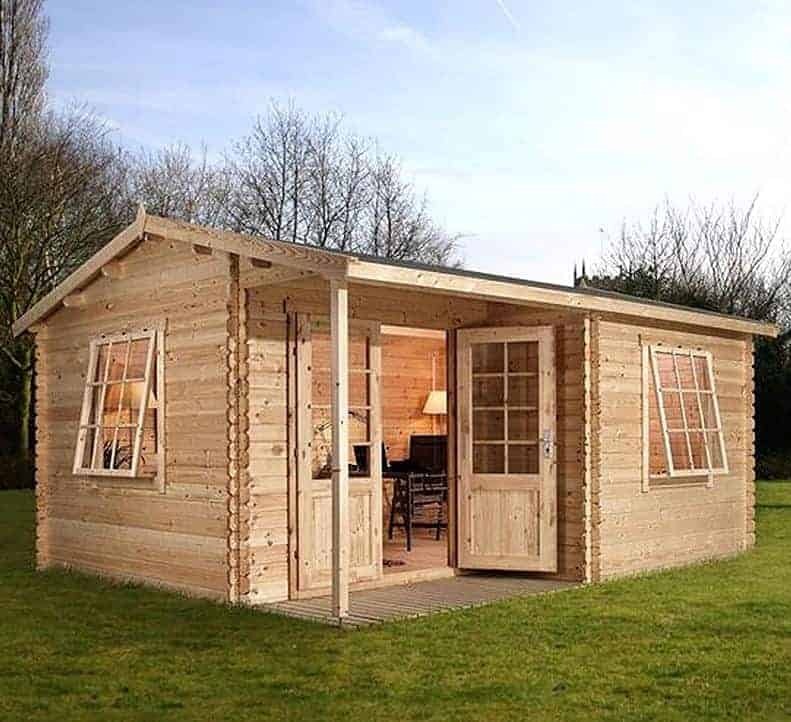 This large log cabin can not only add value to your garden, but to your property as a whole. 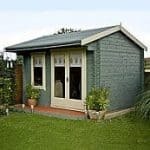 That’s because it’s large enough to be used as an extension of your home, and with the right furniture and equipment installed it could easily be a guest bedroom, home office, or leisure lounge to relax in. 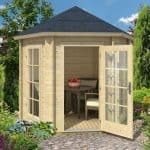 Despite its size and versatility it’s designed to fit into a corner of the garden, so it won’t take up too much space. At the top of the building is a large mineral felt covered roof that adds height to the cabin, and it also ensures that rainwater is carried away rather than being allowed to sit on the surface. This weatherproofing function is also carried out by the tightly interlocking log cladding, so you’ll be sure of a dry interior even when it’s raining outside. Of course, in today’s world protection against potential intruders is just as important as protection against the elements. Thankfully that’s taken care of as well, thanks to a strong and reliable key operated cylinder lock. We feel this provides real reassurance to the purchaser, as does the inclusion of a ten year manufacturer’s warranty against damage caused by rot. This well sized corner log cabin has the appearance of a luxury chalet, and is large enough to become an extension to a house. Rectangular in design, it also features an integrated porch on one corner, which we feel would be a great place to sit and relax on a sunny day, or even to hold a barbecue on. With decorative trim around the roof and strength giving chalet corners as well, we found this to be a highly attractive garden building. At its summit is a felt covered apex roof with strong and durable tongue and groove underneath. It’s very good at repelling rainwater and it gives a ridge height of 2.59m and an eaves height of 2.05m. The overall width of the log cabin is 4.00m and the overall depth is 3.00m. Cladding is all important for a large garden building such as this, so we were pleased to see that tough 28mm logs had been used. They lock together in a tongue and groove style and thus create a surface that’s very hard for water to penetrate. 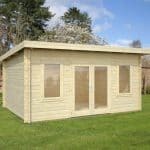 Whilst we have seen even thicker cladding used on some of the log cabins we’ve reviewed, this still creates a very stable building. The floor is also reassuringly solid, being made of the same 18mm thick tongue and groove boards as the roof. What we liked most about it is that it features integrated and pressure treated floor joists. These raise the floor of the cabin above the surface of the ground, and by doing so protect it from the dangerously high moisture content often found there. Ground moisture isn’t the only factor that can lead to rot in a timber building, especially one as large as this, so we were very disappointed to see that no preservative treatment at all had been applied to the wood. Whilst it can be argued that this allows the customer to customise the cabin in a treatment or colour scheme of their choice, it also means that they have to treat the timber not only on an annual basis but also almost immediately after the installation is complete. On a more positive note, however, we were pleased to see that a ten year warranty against rot is provided for those who keep up with the treatment schedule. We were impressed by the size and scale of these doors, and we like the fact that they open out onto the porch area that is in turn protected from rain by the overhanging roof. 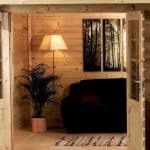 With a width of 1.59m and a height of 1.90m these are considerably more accommodating than most doors we see on the log cabins we review, which makes it very easy to move large items in and out such as sofas or even a bed. The doors are partially glazed, but most of the light that reaches the interior is provided by two large windows. Whilst we welcomed their light giving properties, and especially liked that they open upwards to allow ventilation into the building whenever needed, it’s a pity that they feature standard rather than double glazing. The lack of double glazing also raises some security concerns, as windows are always a potential weak spot on a workshop or log cabin. One security feature that we were pleased with, however, was the key operated lock. 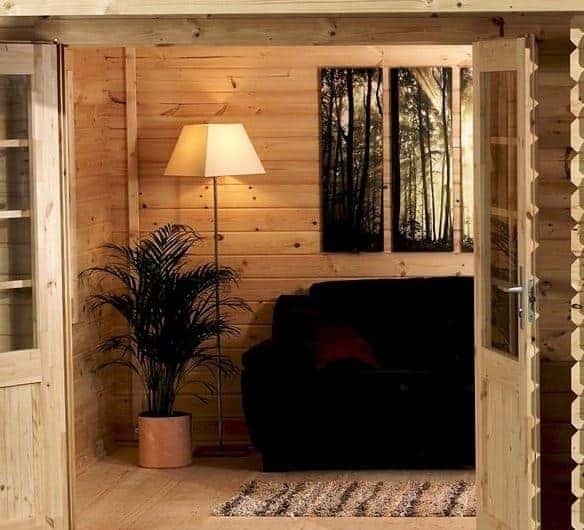 It’s the most effective and tamper proof locking mechanism that a log cabin can have, although we’d still recommend adding an alarm system as well. We were disappointed to find that there are no optional extras available to purchase with this cabin. One item which is essential to buy however is a good quality wood preserver. It makes sense to buy one that contains a colour as well, as this will stop the wood from fading to a silvery grey colour because of UV rays from the sun. This will have to be sourced separately by the customer. We were very impressed by the high quality components used throughout this log cabin, as shown by the tough interlocking cladding. It was good to see a ten year warranty against rot provided, but we would have liked to see this backed up by a long lasting initial treatment. This is one of the biggest log cabins that we’ve reviewed, and yet its design means that it can be positioned in a corner of most gardens. Despite its size this is still relatively easy to construct, thanks to the straightforward instructions. It’s still worth allowing a full day for the task however, even with a friend or two to help. For such a large log cabin, even with the additional expense needed for the purchase of wood preserver, we feel this is good value for money. Final Thoughts: Do you often have guests round to stay, and wish that you had somewhere they could stay for the night? Perhaps you’ve dreamed of starting your own business, and want a home office where you can concentrate on your work? These are just two of the highly useful roles that we can see this good looking log cabin playing. 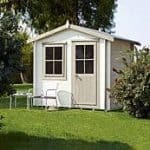 Because it’s so large it’s also very versatile, and for all that it offers and its high quality construction we feel that it’s surprisingly affordable too. 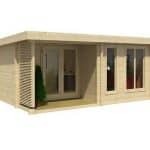 As long as you don’t mind treating it with wood preserver as soon as it has been assembled, and repeating this on a yearly basis, then this is a log cabin that has a lot to recommend it.